2015 is coming to a close, and the realization that you didn't quite make it through your intended reading list has finally hit you. That's OK. If you're like the majority of adult humans in the world, you likely got caught up working, running, paying the bills, and — oh yeah, remembering to eat lunch in there somewhere. Of course, being so frazzled, you probably missed these 11 memorable op-eds as well, which is a real shame, since most of them are nothing short of life-changing. As the media becomes more and more melded with casual journalism — ushering in a new era of news that combines the clickbait rush of a listicle and the traditional structure of a report — op-eds are becoming the de rigueur way of introducing complicated topics so that they're easily digestible for the masses. Sort of like campaign talking points for the people. But op-eds can be much more than just a way of venting partisan verbiage or expressing disdain for one particular policy or another. In some cases, an author has spent enough time in the trenches and hours researching their chosen topic that they become something of an upper level textbook or a guide to the modern world. On Dec. 5, The New York Times published an impassioned op-ed addressing the mass shootings in San Bernardino, California, and at a Planned Parenthood clinic in Colorado Springs, Colorado, suggesting brazenly that citizens "give up" certain types of firearms in order to move the gun legislation discussion forward. 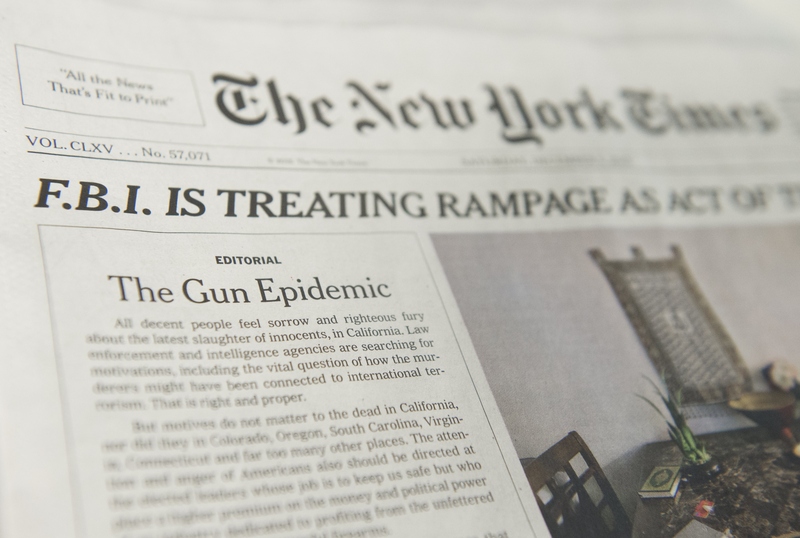 The publishing of the op-ed alone was a historic moment for the 164-year-old newspaper, given that the last front page Times editorial was printed in 1920. "Opponents of gun control are saying, as they do after every killing ... that determined killers obtained weapons illegally in places like France, England and Norway that have strict gun laws," the editorial board wrote on Saturday. "Yes, they did. But at least those countries are trying. The United States is not." Whether or not you agree with the Times, this is a must-read for no other reason than its simple, heartfelt, humanitarian plea. "An old love song speaks of 'the little ordinary things that everyone ought to do,'" Washington Post columnist Colbert I. King wrote in his most recent op-ed, following yet another mass shooting, the attack in San Bernardino. "That phrase used to cover instructions such as: 'Take out the trash,' 'brush your teeth,' 'close cover before striking,' 'look both ways before crossing.' Ordinary things. 9/11 changed all that." A tragic view of the current state of affairs, King forgoes dissection of the particulars, like gun control and mental health measures, opting instead to focus on the silent victims of violent crime — the public. "How do we handle these little ordinary things that have become part of our lives?" he questions, citing what has been reported by some outlets as the 355th mass shooting this year. "That is what we have come to in 2015." Still confused about ISIS and Islamic State militants? CNN National Security Analyst Peter Bergen has you covered in this Feb. 18 op-ed for CNN. "Whenever ISIS carries out a new atrocity, whether it's beheading a group of Egyptian Christians or enslaving Yazidi women in Iraq or burning its victims alive, the big question most people have is: Why on Earth is ISIS doing this?" Bergen writes. "What could possibly be the point?" Bergen then proceeds to break down the motivation behind incendiary attacks and increased recruiting tactics employed by the militant group with simple finesse — making the difficult-to-swallow a bit more palatable. Read for a quick background on the current chaos in the Middle East that doesn't trifle with partisan dialogue. This one's tricky for several reasons. The Atlantic took a huge leap of faith in even printing this piece, for one thing, given the tense social justice dialogue occurring across American college campuses of late. While most outlets were busy covering the outrage associated with a Yale professor's suggestion that students engage in dialogue with peers who had donned offensive Halloween costumes (she's since left her post in the wake of heavy student protest calling for her job), columnist Conor Friedersdorf was banging out a frustrated op-ed on the over-sensitive and pervasive "me" culture of the millennial generation. While Friedersdorf isn't necessarily correct in all of his assumptions, the article being what it is forces readers to re-evaluate the idea of choosing your battles. "A fight over Halloween costumes at Yale has devolved into an effort to censor dissenting views," reads the sub-headline. Take this one with a grain of salt and remember to appreciate the candor. Anyone who's invested in the minimum wage fight (or has worked in the service industry) will appreciate this op-ed by Food Labor Research Institute director Saru Jayaraman in The New York Times. "Last month, Gov. Andrew M. Cuomo threw his support behind a statewide $15 minimum wage for all New Yorkers," explains Jayaraman, "but his proposal is expected to exclude the state's 380,000 tipped workers. ... The omission of these workers in New York not only perpetuates an unfair pay system — in particular, one that reinforces pay inequity for a largely female work force — but also extends an ugly, racialized history." Delving into the Europe versus United States conversation, Jayaraman discusses why other countries likely find it strange that Americans continue to tip everyone for work that should already be compensated fairly, and brushes on the issue of sexism and the unfair burden on female workers. "Women forced to live on tips are compelled to tolerate inappropriate and degrading behavior from customers, co-workers and managers in order to make a living," she explains. "Today, there is universal access to free, public schools across the United States for kindergarten through 12th grade," Democratic presidential candidate and Vermont Sen. Bernie Sanders wrote in his Oct. 22 op-ed column for The Washington Post. "That didn't happen by presidential decree. It took populist pressure from the progressive movement, beginning in the 1890s, to make widespread access to free public schools a reality." If you want a primer on self-proclaimed Democratic socialist Sanders, read his own words and get enlightened on why he believes the things he does. You won't be disappointed: In his own frank words, he'll spill. Less frill and more substance, Bloomberg View's Noah Smith will regale you with facts only, and he'll do it efficiently. Rather than resorting to stylistic prose or moving anecdotes, Smith breaks down the three major statistics missing from most of the political debate surrounding the current 2016 campaign. "Facts and public perceptions aren't always in alignment," Smith writes. In one simple op-ed, the columnist does his very best to correct that error — and he succeeds. Love her or hate her, you can't deny that Carly is invested. Whether or not the polls reflect that is another story, but for the past few months, the former HP CEO has been doing her best to show that she can take on the big numbers and whittle them down to her liking — something that the majority of her fellow candidates simply can't do. "There can be no doubt now: The U.S. economy is struggling, inequality is on the rise and too many Americans feel uncertain about their future," Fiorina writes in the October Wall Street Journal op-ed. (With that sort of rhetoric you have to wonder whether she's still actually running as a Republican.) Her claims may not always be accurate, but just as with Sanders, reading Fiorina's op-ed will give you a look inside her head. The deadly Ebola outbreak of 2014 showed the world the ugly face of western privilege, and it did so in the most ridiculous of ways: Through rabid media reports and panicked rumors, much of the United States fixated on exactly the wrong things: Quarantine, travel restrictions, and morbidly hilarious zombie virus hoaxes. In Pulitzer Prize-winning journalist Tina Rosenberg's November 2015 New York Times op-ed, the columnist instead chooses to discuss the newly tested (and altogether promising) Ebola virus — a breath of fresh air following a long two years of unreasonable knee-jerk reactions. "Ebola is a fearsome virus — but not to vaccine researchers," Rosenberg writes. "[But] vaccine development requires lots of money and attention, and the cruel fact is that both are always scarce for poor-country diseases. That is even more true for pathogens that begin with small outbreaks in remote areas." Read this to restore some of your lost faith in mankind. While the rest of the world was fixated on Paris, innocent civilians in Beirut, Lebanon were dying in the streets after twin suicide bombings took out a marketplace in the southern Bourj el-Barajneh suburb. The media ignored it. Or at least, that's what everyone on social media was claiming. In a frustrated Vox op-ed, columnist Max Fisher laments that this assumption was wholly, 100 percent wrong. "The media has, in fact, covered the Beirut bombings extensively," Fisher writes in the November op-ed, seemingly exhausted. "Yet these are stories that, like so many stories of previous bombings and mass acts of violence outside of the West, readers have largely ignored. ... It is difficult watching this, as a journalist, not to see the irony in people scolding the media for not covering Beirut by sharing a tweet with so many factual inaccuracies — people would know that photo was wrong if only they'd read some of the media coverage they are angrily insisting doesn't exist." This one is a must-read for everyone — in the press and outside of it — and a warning to use Google and news alerts a little more proactively in the future. In order to be an educated public audience, we have to take the initiative. Commentator and political columnist David Brooks doesn't hold back in this Oct. 13 op-ed for The New York Times. In it, Brooks compares the current status of anti-intellectualism plaguing the right wing of the Republican Party with insurgency and radicalism — harsh words, coming from a fellow conservative. "The Republican Party's capacity for effective self-governance degraded slowly, over the course of a long chain of rhetorical excesses, mental corruptions and philosophical betrayals," writes Brooks. "... [But] over the past 30 years, or at least since Rush Limbaugh came on the scene, the Republican rhetorical tone has grown ever more bombastic, hyperbolic and imbalanced." Tread carefully here if you lean right of center, but read on — moderate Republicans, you can thank me later.